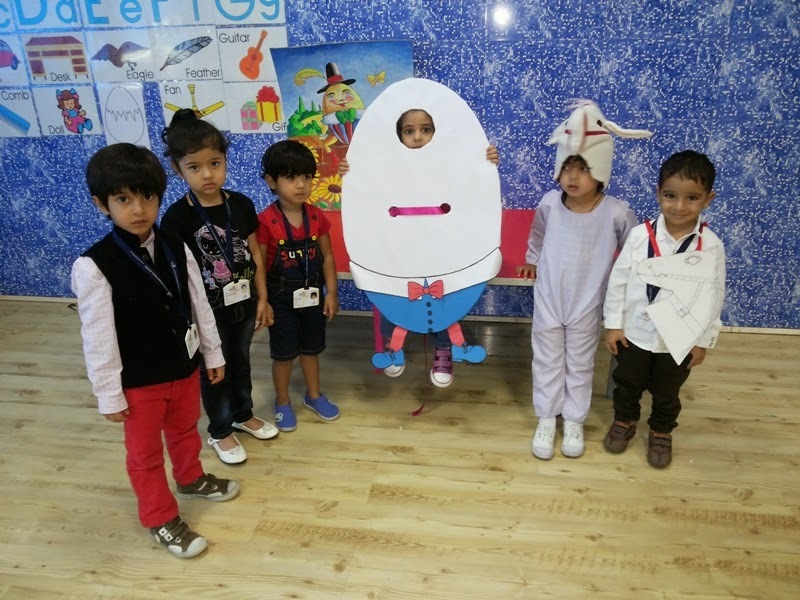 On Saturday, 30th August 2014, little tots of Nursery came dressed as Humpty Dumpty, King’s man, King’s horses for the Rhyme Enactment. They enjoyed the character they were in and also recited the rhyme several times with their peers. Throughout the day they were happy with such learning, experience and dramatization. City Level Round of WWF Nature Quiz- 2014 was hosted by Witty International School, Udaipur. We felt immense pride in organizing Asia’s Largest Wild Life Quiz initiated by WWF India. Teams from 7 schools contested for the city level Wild Wisdom Quiz 2014. The quiz was based on Forest Biodiversity. It raises awareness about the flora and fauna and inculcated a sense of pride amongst students for India’s rich natural heritage. The top 5 scorers of the Quiz had the golden chance to compete at the city level and also won intriguing gift hampers. Bhavesh Malviya (Grade 5-B) and Bhuvi Jain (Grade 4-B) stood First at Junior Level (Grade 3-5). At Middle Level (Grade 6-8) Sonakshi Singh and Hiranshi Shah (Grade 8) bagged consolation prize. ‘Adolescent Health Care’ is the most important aspect of a teenager’s life. A well understood concept can leave a lasting impression on a child’s mind. To get a clear depiction, Witty International School at Pawan Baug, Malad (W) organised a session on ‘Teen Talk’. This session was conducted by Dr.Roopa Saraogi and Dr.Rajendra Saraogi. The talk guided our students and cleared their misconceptions regarding body anatomy and natural growth process. The guest speakers were felicitated by our Trustee and Managing Director Dr.Vinay Jain. His concept of learning about oneself should be given utmost priority and all the school should come forward and bring in this change to enlighten our youth. Students of grades 8th, 9th 10th& AS Level attended the session. The students were divided into groups of two, wherein the girls sat separately and the boys were separate. The girls were addressed by Dr.Roopa Saraogi and the boys by Dr.Rajendra Saraogi. Our guests dealt beautifully with the sensitive issues of puberty, adolescence and hormonal changes. The session was highly interactive and Wittians enthusiastically cleared their doubts. The session helped the students in getting a deep insight into their body structure and behaviour patterns. It was an engaging session and the end of session was kept for clarifying the doubts of the students. The talk ended with our Principal Mr. Bijo Kurien thanking our guests for sparing their precious time and helping our students to gauge their understanding on ‘Adolescence and their Behaviour’. The session ended with the singing of the National Anthem. To appreciate and encourage good behaviour, good performance and to recognize core competency skills and talents hidden within our students, WIS Bhilwara conducted its first Student Motivation Programme of the session 2014-15.The programme aims at rewarding not just winners, but also rewards students showing improvement in their past performance.This programme is not merely focussed on achievement of academic excellence. It focuses on 14 competencies of life skills. Our talents are the gift that God gives to us.... what we make of our talents is our gift back to God. WIS Bhilwara,congratulates Nimesh Upadhyaya of Grade IV for his wonderful creation of battery photo frame and battery car. Congratulations, Nimesh! Keep up the good work! Ganesha (Vinayak), the god of wisdom, prosperity & auspiciousness. The elephant faced Hindu God is one of the most popular deities associated with Hinduism. The Vinayak Chaturthi festival ends with the immersion of the murti on Ananta Chaturdashi Day. Vinayaka is today worshipped around the world. In our school also, we celebrated this with great fun and joy. 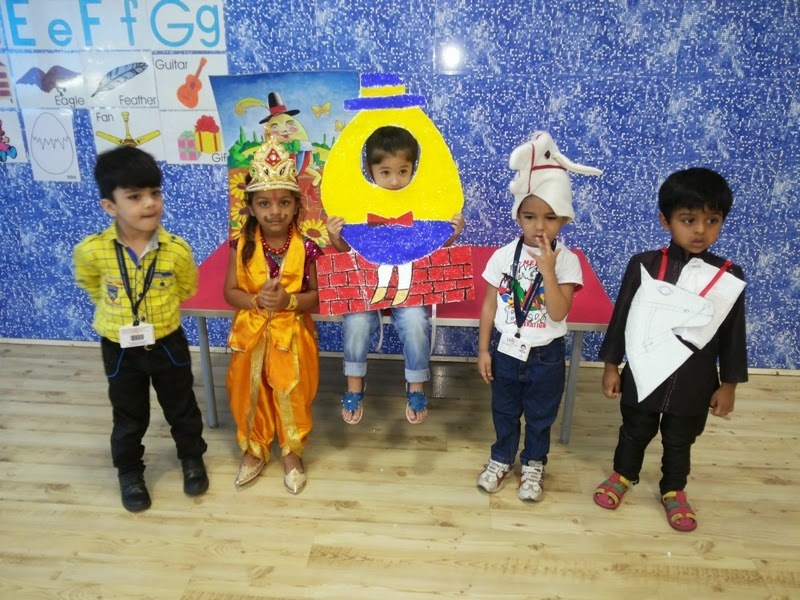 The little angels of Pre-primary celebrated Ganesh Chaturthi with a lot of excitement. The kids saw the power point presentation on Ganeshji, they enjoyed this movie. 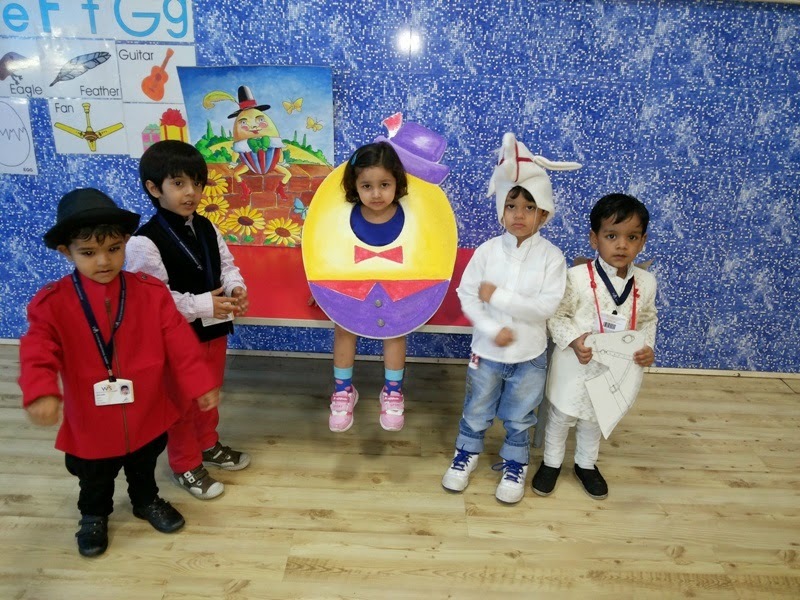 The tiny tots from Nursery to Sr. KG presented the play, song, shlok and aarti. The little ones also did the coloring in worksheet of Ganpati. The kids of Sr. KG made the Ganpati in their scrap book. This was an exciting experience for kids. As per Hindu Mythology Lord Ganesha is considered as “Vigana Harta” (one who removes obstacles) and “Buddhi Pradaayaka” (one who grants intelligence). So this festival is very important for students, they worship Lord Ganesha to illumine their minds. And blessings be showered upon you from heaven up above! The little angles of Play Group Witty Kids, Shastrinagar celebrated Blue Colour Day on Thursday 28th August, 2014 with fun filled activities. The kids were so excited while coming to school as they and their friends were dressed in Blue Coloured clothes and carried their blue toy, purse, bag, bottles or tiffin to school. They were thrilled to see their teacher also in blue and the classroom fully decorated with blue balloons, blue toys, blue kites etc. The kids sorted the blue beads and blur balls and enjoyed blue balloon dabbing with blue colour on witty art sheet. The Blue Colour Day celebration for the little angles was like Blue, Blue everywhere Blue as they winded up the day by watching the Billy Blue Boy story. On Thursday, 28.08.2014 the Little Wittians of Sr. KG did Show and Tell activity. Children brought different transport toys like helicopter, airplane, car, cycle, buses, boat train etc. Each child came with his or her toy described the various characteristics of the transport toy. Children enthusiastically participated in the activity and keenly observed their friends transport toy and listened to its lines. 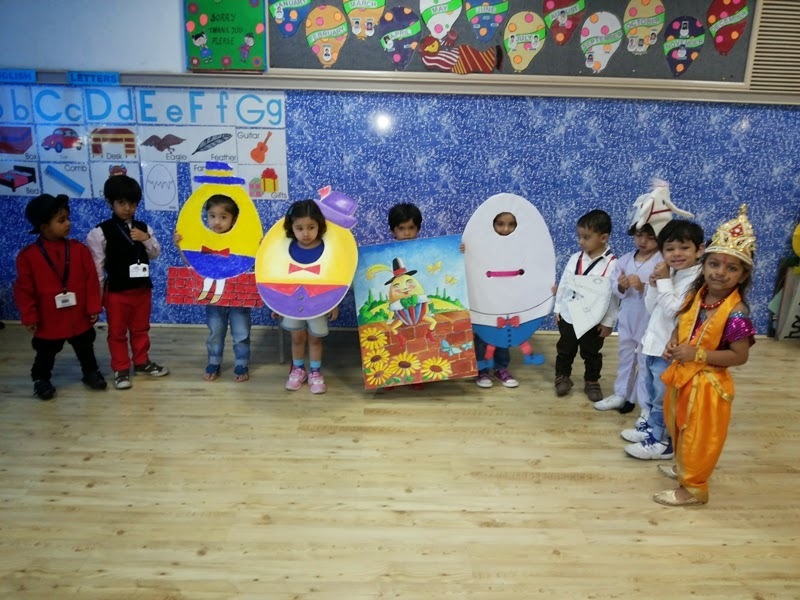 The toddlers of Nursery were introduced to the concept "Awareness of Babies" on Thursday, August 28' 2014 with a lot of thrilling activities. A mother and baby visited the Nursery sections; kids saw the baby and they understood the difference between adult and a baby with the help of many things such as bath tub, diaper, feeder, seeper etc. The little ones also made the rattle with the help of green and orange marble paper, white sheet and ice-cream stick. This was a fun learning experience for kids. The toddlers of Play Group celebrated Blue Colour Day on Thursday, August 28' 2014 with a lot of exciting activities. The entire classroom was decorated with blue colour objects. The tiny tots and their teachers came to school in blue coloured clothes and brought their favourite blue colour objects such as ball, bottle, car etc. The kids sorted the blur beads. The little ones did the balloon dabbing of blue colour on witty art worksheet. The kids also sorted blue balls, during ball pool play. The little buddies could recognize the blue colour in an interesting way. 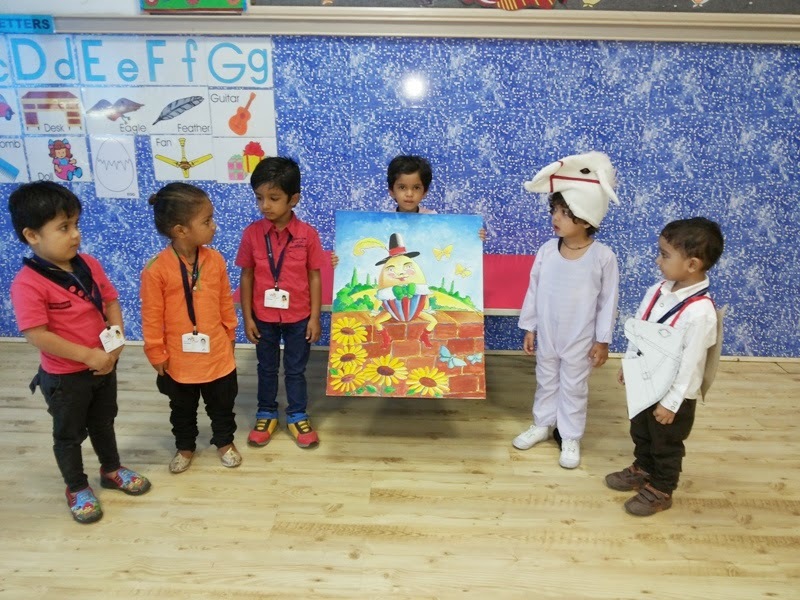 The toddlers of Nursery celebrated Hat Day on Wednesday, 27th August, 2014 with a lot of interesting activities. The kids brought colourful hats from their home. The little ones learnt the 'H' sound with the help of hats. The toddlers also made 'H' with the help of blocks and they also made 'H' by lying down. Children could recognize 'H h' and this was an interesting experience for them. I got a hat, it’s a big straw hat. Then I spin around and clap, clap, clap! The tiny tots of the mother toddler program had a hat-astic day on August 27, 2014! The mamas looked suave and the babies looked adorable in their colourful hats! The hats were worn to bolster the monkey and cap seller story narration. The children heard the story and then watched the dramatization of the story with rapt attention. In all they had a swell day!